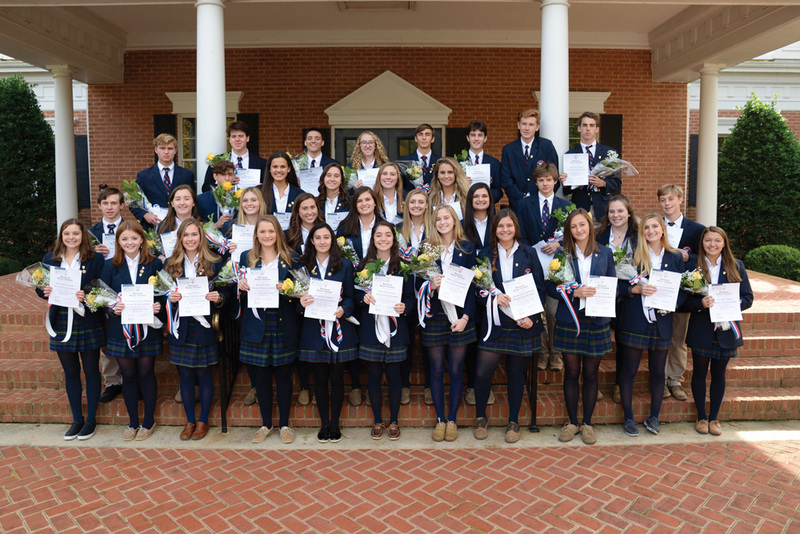 The Charles R. Jenkins Chapter of the National Honor Society at Worcester Preparatory School (WPS) inducted 36 new members on Thursday, Nov. 8. Pictured, from left, are: front row, Annika Larsen (Ocean City, Md. ), Quinn McColgan (Millsboro), Rylie Carey (Dagsboro), Hana Miller (Willards, Md. ), Ellie Todorov (Bishopville, Md. ), Kathryn Marini (Lewes), Maddy Shanahan (Ocean City), Saylar McGuiness (Rehoboth Beach), Ashley Laws (Berlin, Md. ), Madison Van Orden (Berlin), Carly Hoffman (Ocean City); second row, Charlie Brinker (Berlin), McKenzie Blake (Lewes), Damiana Colley (Berlin), Abbi Nechay (Hebron, Md. ), Jenna Elrick (Salisbury, Md. ), Kennedy Humes (Rehoboth Beach), Aly Matha (Greenbackville, Va.), Audrey Stearns (Berlin), Max Taylor (Ocean City); third row, Enzo Zechiel (Lewes), Sami Repass (Lewes), Emily Copeland (Lewes), Abi Plylar (Salisbury), Clare DeMallie (Ocean City), Spencer Paquette (Ocean City); and, back row, Ryan Cronin (Selbyville), Alec Dembeck (Ocean City), Alec Willing (Salisbury), Kelly Polk (Bethany Beach), Kurt Leinemann (Ocean City), Devin Wallace (Berlin), Frank Carter (Lewes) and Gavin Hentschel (Salisbury). Not pictured are Max Huber (Berlin) and Eli Prushansky (Salisbury).